Requests - John will listen to. Orders - not so much. Actually, the request I tried to dismiss, but did eventually listen to, is one that I now like very much, having tried it. 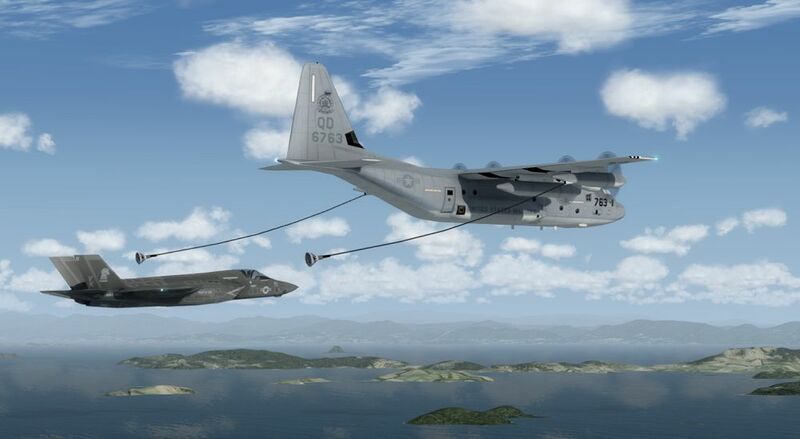 I've successfully added the refuelling hoses to the USMC KC-130J's today. The Hellfire missiles and FLIR have also been added to a separate KC-130R Harvest Hawk model. I'll post some screen shots shortly. That was going to be another question on the polys to add external weps to the H-Hawk and AC-130s, but answered. For someone that mostly flies "military style" in P3D w/ Tacpack, I do 90% of my tanking in DCS, but do use the AI Razbam tankers (KC-130,KA-6) that came with payware models. Bit of clarification John. KC-130Rs were C-130Hs refit to KC-130F standard. They have all been retired, though six returned from the desert to serve with the JMSDF after having their refueling systems removed. The Harvest Hawks are all KC-130Js. Each squadron has three Harvest Hawk kits and can (theoretically) put them on any aircraft. So just to confirm, there are no KC-130Rs at Iwakuni? The allocation of Harvest Hawk kits did pose a bit of a puzzle. I read that the USMC had only 6 kits but an announcement had been made to expand that, but to an unknown number. By chance I was going to equip 3 of the VMGR-152 aircraft with them anyway. Hopefully I don't confuse matters more here. There were 14 C-130Hs converted to KC-130Rs and transferred to the USMC, as per Brent. Six of these had the refueling gear removed and were sold to the JMSDF as C-130Rs. The other 8 are collecting sand. At Iwakuni, VMGR-152 operates 14 KC-130Js only. That is correct. They are all KC-130Js at Iwakuni. The only non J KC-130s left with the USMC are a handful of KC-130Ts with VMG-452 at Stewart ANGB. They are transitioning to Js right now. As to how many they have. The initial set was 3 for testing. When it didn't blow up in their faces they added 3 more. That allowed both VMGR-252 and VMGR-352, the two squadrons most active in Afghanistan at the time, to have 3 That's the initial six that went to Afghanistan. Once they proved the system worked in combat another 3 were ordered for VMGR-152. That gave all three active duty squadrons Harvest Hawk capability. The reserve guys in VMGR-234 did not get to play with the new toys. And now that everyone in the corps is happy with having their own fleet of pseudo gunships, they plan on upgrading all of their Js to Harvest Hawk+ standard, complete with a bolt on 30mm cannon in the left paratroop door. But, that program is still in the testing phase and hasn't been rolled out yet. When I lived in Pensacola, FL and went to Destin, FL., I saw a couple of Spookys fly into Hurlbert Field and they are really scary looking aircraft. Your worst nightmare from above. For testing, the drogues were set to deploy at 2,000ft and above. I think air to air refuelling is normally done at around 20,000ft, but I'll set the trigger at 5000ft and above for those who don't want a long climb to the tanker. I'm sure Brent will provide a couple of flight plan scenarios from Iwakuni once I've delivered the aircraft to him. 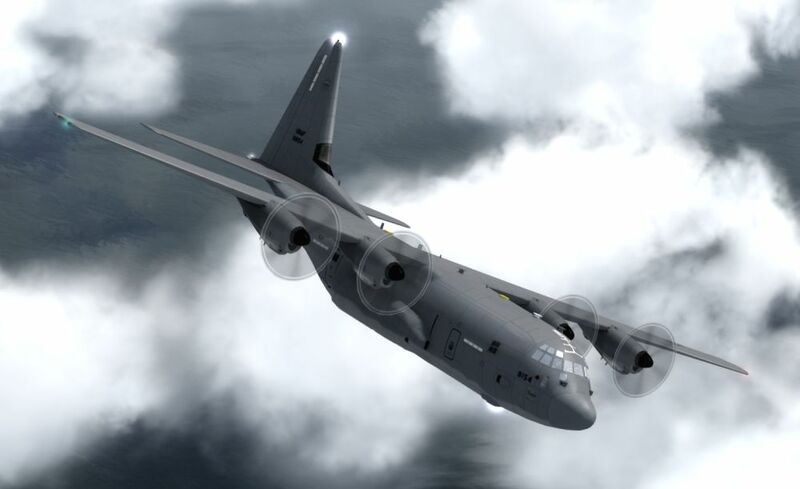 I want to do a revision to the C-130J-30 textures for the Yokota aircraft next. The shiny square metal plate behind the APU on the left sponson is missing. Once I've done that (quick job), I'll move on to the 7 EC-130J's at Harrisburg. I haven't yet researched scenery for Harrisburg and users also need Hulbert Field, Keesler, Davis Monthan and Elizabeth City for all 3 sim versions. Does anyone know the state of play please? They look great John, thank you so much for making the drogues extend I think tanking with the KC-130's is usually carried out between flight level 150 and 200 for fast jets. I'd like to think that this amazing screenshot is the culmination of over a decade of trial and error with this flight simulator series and it is truly amazing from many aspects, the scenery, the models, the environment, the planning and execution. It's all there in this one shot. Bravo John! That's a nice observation Mike, thank you. It's probably about 17 years worth of trial and error, given the learning curves and practice with all sorts of things, including, I'm sure, Brent's discoveries with FSX/P3D scenery that has enabled the background to the screen shot. 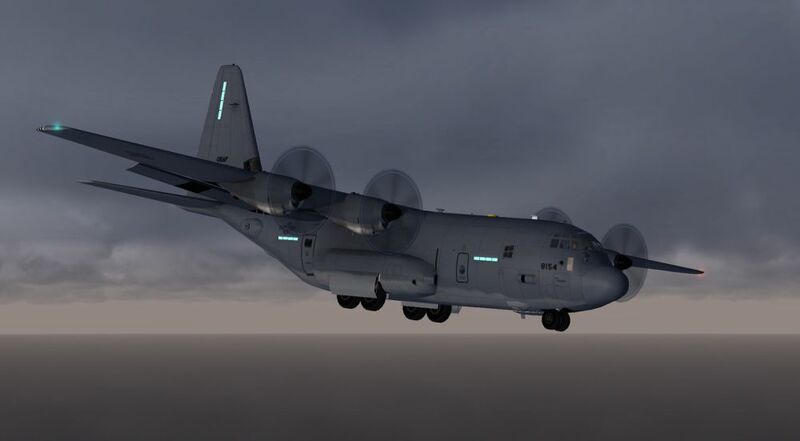 Even on this C-130 project I learned something new - how to create slime lights in all 3 sim versions. This afternoon when testing drogue deployment triggers, I realised, with a prompt from Steve, the need to set INDICATED_ALTITUDE above about 8000ft or hoses will be deployed on the ground at airfields like Tonopah (5548ft). It most certainly has been a voyage of discovery and a very enjoyable one too, made possible with a lot of help from a lot of people - Kevin (xml) and Mike M/Steve (FDE), especially and contributions of scenery and flight plans by enthusiasts here. The aircraft feature re-shaped engines thanks to "airplanedokor" who is indeed just that. I'll be retro-fitting those to the previous models too. Those are looking good John! 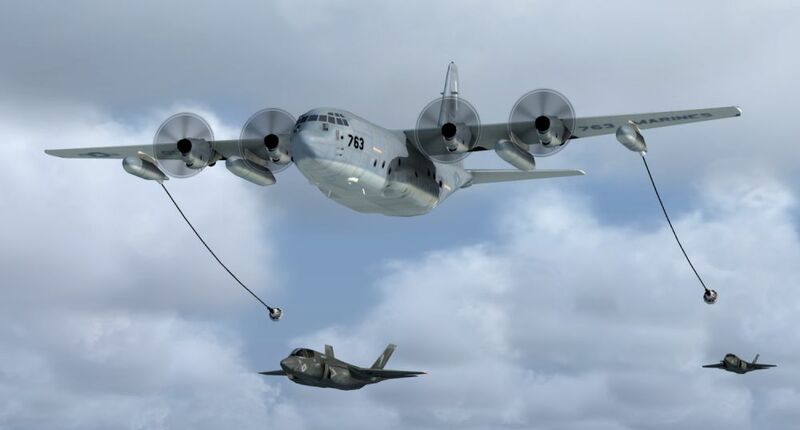 Will be C130H Tanker be made too? Royal Moroccan Airforce has two of these. 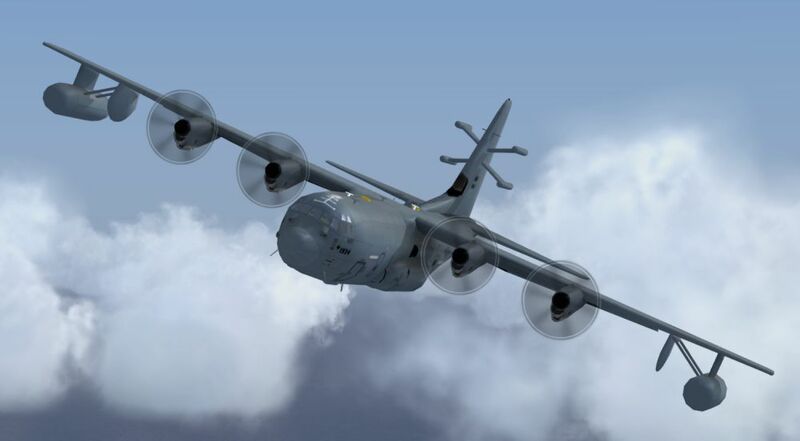 Will C130H and older versions be availible in the future and will they be in FS9? Hi John. I would like to thank you for your extraordinary productivity with beautiful models like this new surprise that you bring us. Thanks Miguel, that's very kind of you. Asdro, I need to finish the "J specials" first before I plan what else to do. At the very least, I want to do some "H" based versions for a particular airfield. They will be for all 3 sim versions.